Morningstar's SunGuard SG-4 is the world's leading single module controller. We have combined all the advantages of our SunSaver charging circuit with less expensive packaging to provide an economical controller for small PV systems. 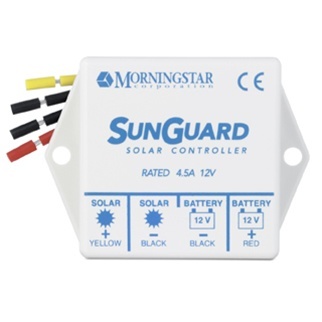 Morningstar’s SunGuard is the most advanced small, economical solar charge controller on the market today. Temperature compensation: A sensor measures ambient temperature and corrects the constant voltage setpoint by –28 mV per °C with a 25°C reference. This works best if the SunGuard and battery are in a similar thermal environment. The MorningStar SunGuard is a fully epoxy encapsulated outdoor rated 4.5A "ice cube" sized 12V PWM charge controller. It has built-in temperature compensation, lightning protection and easy 4-wire hookup. The SunGuard's regulation voltage is set at 14.1 (best for sealed or gel batteries) and is not adjustable for battery type like MorningStar's other controllers. It's dimensions are 2.5" x 2.0" x 1.5" and it weighs just 3 oz. Use only with a 12 volt battery. 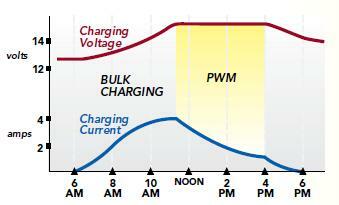 SunGuard uses an advanced series PWM charge control for constant voltage charging. A true 0 to 100% PWM duty cycle is very fast and stable for highly efficient charging.The SunGuard prevents the battery from discharging through the solar array at night. There is no need to install a blocking diode for this purpose. I would give this 5 stars, but the 1st solar controller I bought cracked internally and stopped working. With the new one, I see a note that indicates that it will fail if exposed to temps over 140F - news to me, but I may have missed the info several years ago when I bought the 1st one. The controller could certainly have been made to work at higher temperatures, like temps seen in a black battery box sitting in the sun on a dock (use battery to power my boat lift, battery box is now painted white to solve heat problem).